Boot Tips and Heel Caps to Match. They aren't for everybody, but for those that like them, boot tips and heel caps add a sparkle that makes a smile become a lot bigger. In our store, we have a glass case of these additions so that a customer can see them all at once. They often ask which color will look best. Now, this is a matter of opinion, but sometimes I'll ask them to open their mouth real wide. They always look at me funny. I just tell them that it is best to match a gold front tooth, or the color of fillings, or ...! All right, I've finished laughing. Have you? (I also prefer trimming my eyebrows so I won't be accused of imitating Andy Rooney.) Black boots will go great with any color. Pick the color of jewelry you most wear. Browns look really good with the gold, or antique gold finishes. Reds, burnt apple, or cordovans look good either way. 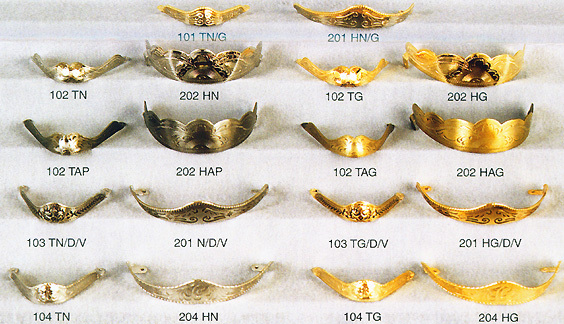 Several of these decorations are both silver and gold, like most belt buckles! But, overall, gold is our best seller. Which style do I choose? The first pair of tips I put on my boot were to cover a scar I chunked in the toe of my dress boots. So, if this is the reason for decorating, get the ones that will cover or distract from the scar. Most boots look fine with a pair that wrap around the front of the boot without taking away from what art is already established. Our best sellers are the 105, 110, 112, 124, & 302SM series. Putting an over the toe tip on a contrasting wingtip boot can be a social no no. Yes, I have worn the heel caps without the toe tips. Heel caps are good to protect a boot from all the grinding that dirty carpet in a car or truck can inflict on any footwear while driving. No, you can't get a spur to fit properly low with a heel cap on the boot. Ya gotta raise yer spur just above that heel cap. The over the toe variety of tips normally stick out past the boot enough to let grime clear itself from beneath the boot tip. They give a more pointed appearance to a J or R Toe boot. Over the toes do not fit on 6 or roper toe boots. They need a tip that carries around the front only. Heel caps do not always hug the exact lines of the boots when you look at them off your feet. They are designed for some flex in movement. You need that, or a good marching rhythm. I could probably write ten pages on experiences with boot decor. But, the easy thing is to just call and ask if your favorite tip or heel will work on your boot style. See, this isn't always as "cornfusin" as it sounds! We can even walk ya through installation. Or if the boots and tips come from us, we'll install before they ship to you. When we install the boot tips and heels for you, we shape the tips and heels before we try to attach them. They are malleable and will bend for you. Just go slowly and carefully. I like to also add a little tilt angle to the plane of the attachment area. (This means I twist the hole about to 45 degrees so the nail or screw goes in at an angle. This seems to hold better. Some soles. like the kids need screws for a better hold. I almost always use nails for the heels because the nail heads lay more flat and are less likely to catch on anything. The tips attach to the top of the sole with one exception, and won't catch stuff. Use an awl, or an ice pick to begin a starter hole so application is easy. When you attach the heels, be sure you go under the rand of the heel and into the heel. Some boot styles look like they are in place, but are between layers. Again, just call if you have any fears and we'll walk you through them. Then, there are boot bracelets, chains and other fun things! Kilties too. Sometimes, also called Toe Rands. When a boot is factory made with a toe tip, it is normally made into the boot as the sole is injected onto the boot, or it is attached with nails. When we add one of these to your boots, we select either nails or screws, depending on the holding power of the sole material. Although the screw heads rise a little higher than the nails, they have more holding power in many soles. We also adjust the angle of the tip to closely match the angle of the toe of the boot before we attempt to attach. This makes for a better look and fit. If you are attaching your own tips, let us know the boot it is for and we can make some adjustments for you, before we ship the tips. Fits R or J toe. $14.99 pair 100TG - Small Tip Gold finish Engraved Fits R or J toe. $14.99 pair 100PTN - Med Tip Nickel finish Plain Fits R or J toe. $15.99 pair 201HN - Med Heel Nickel finish Engraved. $14.99 pair 201HN/G - Med Heel Nickel finish/Gold Rope Edge. Engraved. $14.99 pair 202HN - Large Heel Nickel finish Engraved. $14.99 pair 102TG - Med Tip Gold finish Engraved Scalloped Edge. $14.99 pair 202HG - Large Heel Gold finish Engraved. $14.99 pair 202HAP - Med Heel Antique Nickel finish Engraved. $14.99 pair 202HAG - Med Heel Antique Gold finish Engraved. $14.99 pair 201HN - Med Heel Nickel finish Engraved. Etched Edge. $14.99 pair 201HN - Med Heel Gold finish Engraved. Etched. 105TN - Narrow Tip Nickel finish Plain. Fits any toe, child or adult. $9.99 pair 105TG - Narrow Tip Gold finish Plain. $9.99 pair 105TAP - Narrow Tip Antique Nickel finish Plain. $9.99 pair 105TN - Narrow Tip Antique Gold finish Plain. $9.99 pair 106TNDV - Small Tip Nickel Dark Engraved finish Rope Edge. $12.99 pair 106TNDV - Small Tip Nickel Engraved/Gold Rope Edge finish. 107TN-E - Square Toe Tip Nickel finish. Eagle on Engraved. $15.99 pair 107TG-E - Square Toe Tip Gold finish. Eagle on Engraved. Fits R or J toe, child or adult. $14.99 pair 209HN - Med Heel Nickel finish Engraved. Etched Edge. $14.99 pair 209HG - Med Heel Gold finish Engraved. Etched Edge. $14.99 pair 201HN - Med Heel Antique Nickel finish Engraved. Etched Edge. $14.99 pair 209HAG - Med Heel Antique Gold finish Engraved. Etched Edge. 112TN - Small Tip Nickel Engraved finish Rope Edge. $13.99 pair 112TG - Small Tip Gold Engraved finish Rope Edge. $14.99 pair 112TAP - Small Tip Antique Nickel Engraved finish Rope Edge. $13.99 pair 112TAG - Small Tip Nickel Antique Gold finish Rope Edge. 114TN - Medium Tip Nickel Engraved finish Rope Edge. Fits any toe, youth or adult. $13.99 pair 114TG - Medium Tip Gold Engraved finish Rope Edge. $14.99 pair 114TAP - Medium Tip Antique Nickel Engraved finish Rope Edge. $13.99 pair 114TAG - Medium Tip Antique Gold Engraved finish Rope Edge. 115TN/D/V - Narrow Tip Nickel Dark Engraved finish. $12.99 pair 114TG/D/V - Narrow Tip Gold Dark Engraved finish. 124TN - Med Tip Nickel finish Engraved Scalloped Edge. $14.99 pair 224HN - Large Heel Nickel finish Engraved. 124TG - Med Tip Gold finish Engraved Scalloped Edge. $14.99 pair 224HG - Large Heel Gold finish Engraved. 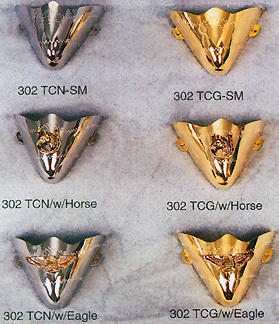 $14.99 pair 124TN/G - Med Tip Nickel finish Engraved / Gold Scalloped Edge. 124TAP - Med Tip Antique Nickel finish Engraved Scalloped Edge. $14.99 pair 224HAP - Large Heel Antique finish Engraved. $14.99 pair 124TAG - Med Tip Antique Gold finish Engraved Scalloped Edge. $14.99 pair 224HAG - Large Heel Antique Gold finish Engraved. 203HN - X Large Heel Nickel finish Engraved. $19.99 pair 203HG - X Large Heel Gold finish Engraved. 302TCN - Over-the-Toe Cap Tip Nickel finish Engraved Scalloped Edge. Taller profile. Fits R, best fits J toe. $19.99 pair 302TCG - Over-the-Toe Cap Tip Gold finish Engraved Scalloped Edge. Taller profile. $19.99 pair 304TCN - Over-the-Toe Cap Tip Nickel finish Filigreed Scalloped Edge. Taller profile. $19.99 pair 304TCG - Over-the-Toe Cap Tip Gold finish Filigreed Scalloped Edge. Taller profile. 305TCN/D/V - Over-the-Toe Cap Tip Nickel Dark Engraved finish. Scalloped Edge. Taller profile. $19.99 pair 305TCG/D/V - Over-the-Toe Cap Tip Gold Dark Engraved finish. Scalloped Edge. Taller profile. $19.99 pair 504HN - X Large Heel Nickel finish Filigreed. $19.99 pair 504HG - X Large Heel Nickel finish Filigreed. 302TCN -SM - Over-the-Toe Cap Tip Nickel finish Engraved Scalloped Edge. Smaller profile. $19.99 pair 302TCG -SM - Over-the-Toe Cap Tip Gold finish Engraved Scalloped Edge. Smaller profile. 302TCN -SM w/Horse - Over-the-Toe Cap Tip Nickel finish Engraved Scalloped Edge. Smaller profile. Horse head in Horseshoe Motif. $24.99 pair 302TCG -SM w/Horse - Over-the-Toe Cap Tip Gold finish Engraved Scalloped Edge. Smaller profile. Horse head in Horseshoe Motif. 302TCN -SM w/Eagle - Over-the-Toe Cap Tip Nickel finish Engraved Scalloped Edge. Smaller profile. Spread Wing Eagle Motif. $24.99 pair 302TCG -SM w/Eagle - Over-the-Toe Cap Tip Gold finish Engraved Scalloped Edge. Smaller profile. Spread Wing Eagle Motif. People that wear Western dress boots do not just wear them to look like cowboys. Western boots have become mainstream footwear in offices, at worksites, and in the backyards of millions of homeowners. The arch support and quality craftsmanship allow us to go all day without sore feet and aching backs or legs. Scientific studies have been published on the benefits of good footwear, and on the fallacy of "cheap" stuff. Consider this quality for your wife and children, too. Especially during the growing years, the bones of the feet will form only as well as their footwear allows. Proper care when young will pay tremendous dividends in all their years to come. Tips and heels installed properly will not adversely affect fit of a boot. They can make an ordinary boot extraordinary. If you need to go back to the exact page you came from, Just click the back button on your browser.